Helichrysum Oil: Offers high levels of regenerative italidiones, as well as rare diketones, which stimulate the growth of new skin tissue, fade scars, stretch marks, and blemishes. It aids in healing skin on a deep cellular level. Tamanu: A remarkable restorative oil with skin healing, anti-inflammatory, and antioxidant benefits. Grown in the mineral-rich volcanic soil of Polynesia, it is powerfully potent in soothing acne, scarring, eczema, age spots, and wrinkles. Chia Seed: Potent with antioxidants, vitamins and an alpha-linolenic acid – it maintains moisture in the skin to prevent drying and scaling. Black Cumin: Praised for its potency at fighting bacteria that causes acne, rosacea, eczema, and other skin infections; as well as for being a potent moisturizing agent, and anti-aging booster. Turmeric: Treats acne and skin inflammations. Offers calming, antioxidant, detoxifying and anti-carcinogenic characteristics. Your skin will drink in the restorative power of this multi-correctional facial serum. Each golden-orange drop of The VITALITY ELIXIR Facial Serum delivers nutrient-rich actives to relieve oxidative stress, combat acne, fight signs of aging, hydrate, and much more. Infused with powerhouse antioxidants, the lightweight formula covers all the bases for all skin types to restore a balanced, healthy glow. After cleansing, rub 1-2 pumps of serum between your palms to activate the formula. Firmly press hands over your face for 15-30 seconds. Gently massage into skin if desired. Pat an extra drop under eyes to soothe puffiness, dark circles, and signs of aging. Follow with The RARE INDIGO Beauty Balm (best for normal to oily skin) or The MAHALO Balm (best for dry to normal skin). I have normal skin that is prone to acne and unfortunately this broke me out. It is a beautiful serum in that my skin is so hydrated and plump after using but like the previous review said - acne is a deal breaker for me. If you do not generally have issues with breakouts and are looking for something that is intensely hydrating this might work for you! Also, the smell is very strong - I personally love it and find it to be almost calming but just note that there is a lingering spa like smell. Slight, mini breakouts. 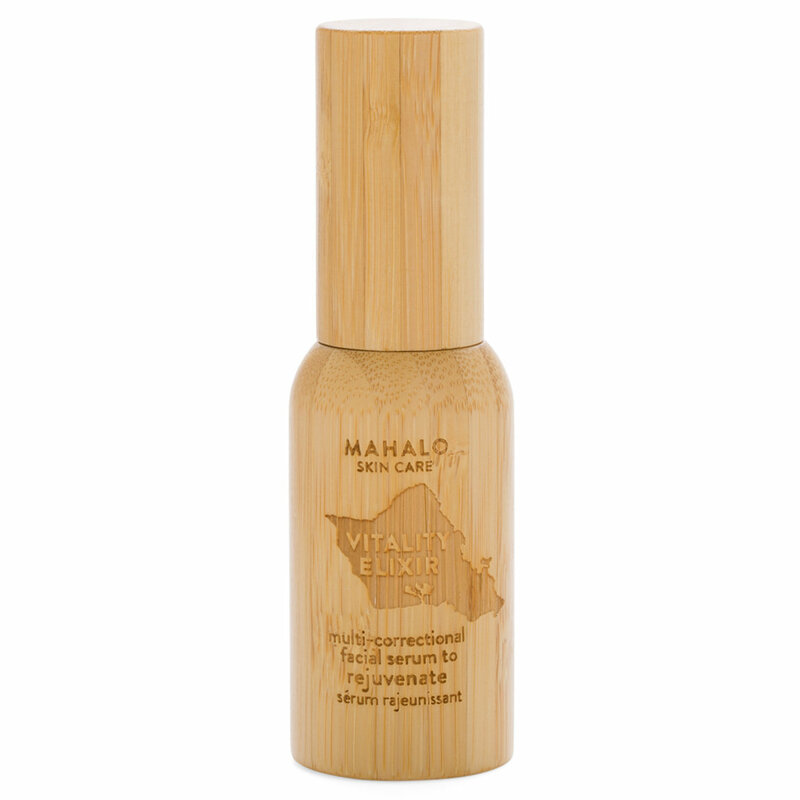 I had such good luck with the BEAN mask by Mahalo (still love it, using it for many months), but not so much with the Hawaiian Hydration Concentrate and this Vitality Elixir Serum. The breakouts caused by this Vitality Serum were not as bad as those caused by the Hydration Concentrate so it took me a while to figure this one out (oh, that's just stress... yesterday's pizza... hormones etc.). I thought about just putting up with the mini breakouts because there's a lot I love about this serum. I personally really love the oil texture, very smooth. It absorbed quickly into my skin. My skin felt hydrated, radiant, protected against harsh winter conditions and yes, I saw mini firming of my skin and improvements of my texture (but no fading of hyperpigmentation which maybe would have taken more time, IDK). The bottle is nice and the pump is high quality – no oily mess. It clearly didn't combat acne or inflammation (product claims) for me. I will pass this product on because I've really had enough breakouts in my teen years and early twenties; breakouts are a dealbreaker for me. Please keep in mind that my skin is sensitive and acne prone. Your skin might be fine with this serum and you might love it. My rating would be a 3.5 but I rounded it up to 4 stars because the breakouts were minimal and I enjoyed many things about this serum. This is probably my fourth purchase of this particular face serum. It is a heavier serum, but it performs beautifully in the areas of hydration and overall glow (at least for me). I have acne prone skin and this is one of the few "indie" luxury brands that doesn't break me out. I use the Mahalo Rare Indigo Balm, as well. I use it both am and pm in the winter months (here in Hawaii) and find it perfect. I will say, however that as with all indie/small batch brands, the consistency in the scent and color differs with each batch. For example, I recently purchased the Mahalo Balm and the scent is quite different than my previous purchase. Same goes for this, as my last purchase did not smell as strongly as this one does. This product is very intensely packaged. It has a very strong odor. Using it for a short time and it takes some time to sink into skin. It is not silky but slightly greasy.